Can we really have had Glastonbury again already? Where does the time go! We’ve already given you some top tips for festivals in another post last week and it got our juices flowing. Recent times have seen us all try to be more self sufficient, making more things for ourselves and going back to basics. RLD staff kept up the theme with a visit to our partner L’atelier des Chefs recently, to try out their street food cookery class. 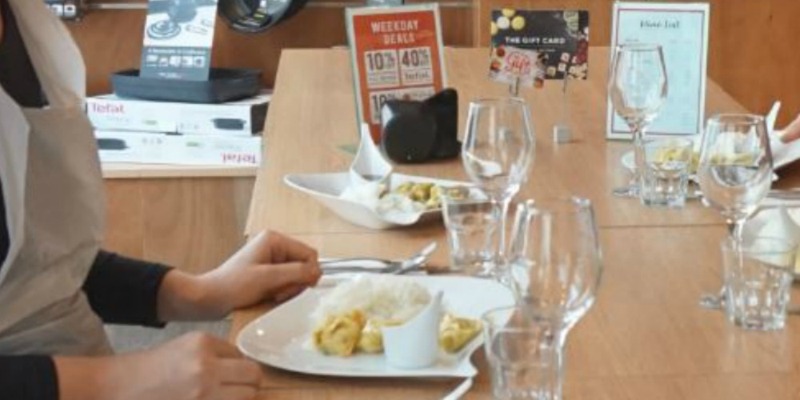 We share their experience and give you some great recipes too, read on! 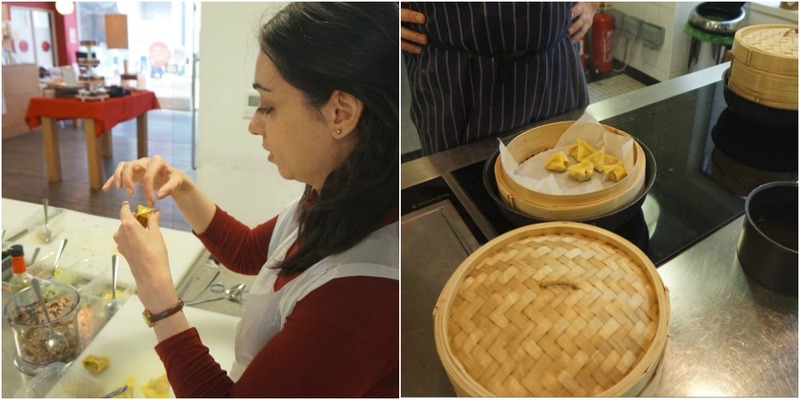 Gemma and Zerrin took themselves off to St. Pauls in the city of London recently to join some other eager lunchtime foodies who were there for a fast and furious introduction to South East Asian street fare. Our girls loved the open and airy venue, with its welcoming glass front which enticed passers by. Being just a stone’s throw from the magnificent St. Paul’s Cathedral, L’atelier des Chefs attracts plenty of city workers and many a busy professional had joined this lunchtime class as a treat and an escape – it’s certainly a different way to spend a lunch hour! One of the main takeaways from the experience was the speed of the class, with cooking taking just half an hour. Everything was prepared and laid out ready for budding cooks, and it was simply a matter of keeping up with the instructions of the main chef. He was assisted by a couple of hosts but was singled out by Gemma for his special thoughtfulness, since she is a vegetarian and he was scrupulous about keeping her ingredients and equipment away from any meat or fish. Soak the dried mushrooms in warm water and the wakame in cold water. Then drain each separately and blitz in the food processor. Peel and blitz garlic, ginger and chillies separately. Thinly shred cabbage leaves. Roughly cut chicken and the prawns and blitz (again separately). In a bowl mix all ingredients together. 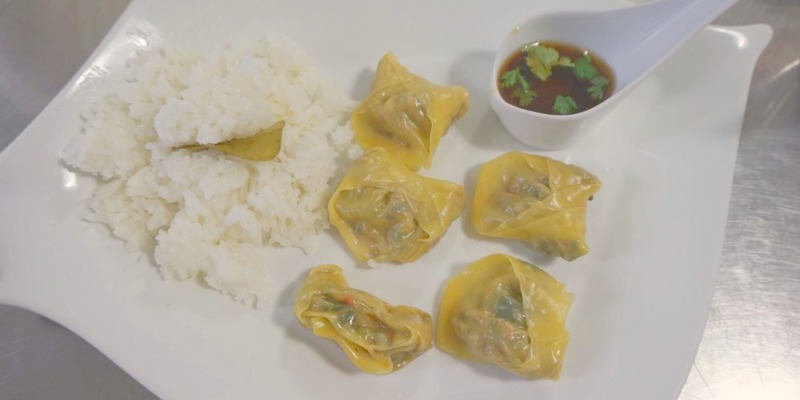 Lay out won ton wrappers and add a spoonful of filling to each. Brush the edges of each dumpling with water and fold in half to seal, pressing firmly. Line the base of the steamer with baking parchment to prevent sticking, add the won tons and steam for 3 minutes. Rinse rice under cold water. Bruise the lemongrass stick by crushing with the back of a knife. Place rice, lemongrass, lime leaves and salt in a pan. Boil and cook with a lid on for 5 minutes then reduce heat to a simmer and cook for a further 5 minutes. Remove from heat and allow to steam for another 5 minutes to complete cooking. Garnish with finely sliced spring onions to serve. Finely chop chillies and coriander leaves and squeeze in the lime juice. Heat vinegar and sugar together until sugar dissolves then add the soy sauce and let it cool. When cool, add in the chopped mix. With all this and the second half of the experience consisting of sitting down together to eat the delicious creations, with a dessert and a glass of Prosecco included, we think you will agree that this L’atelier des Chefs cooking experience is a fantastic way to spend an hour learning a delicious new skill. 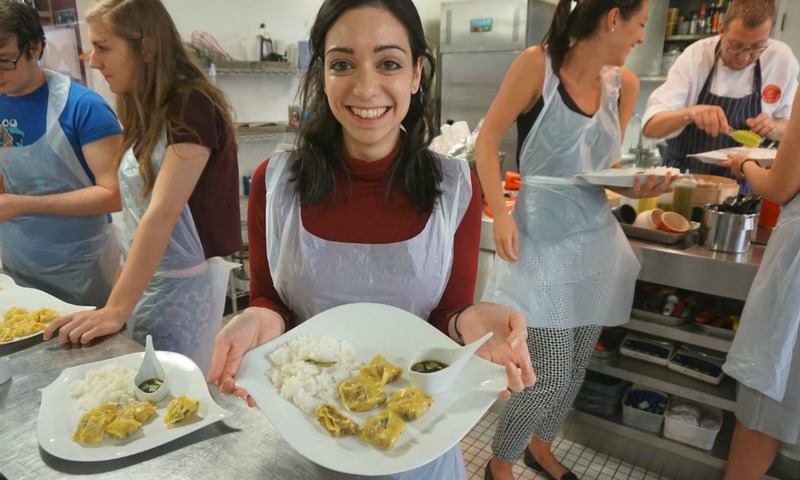 Both Gemma and Zerrin are confident to intend making these dishes again at home. We just hope they bring some into the office for us next time! Want to join in and learn some new cooking skills, check out our Food and Cookery Courses page.